For a good few years I’ve admired Jennie Maizels books, they really are pieces of art in themselves. A few years ago she very kindly signed a few editions for my god-daughter and I was quite envious when they arrived. I first came across her books as a by-product of my interest in sewing- she creates these brilliant Iron On Patches. These patches were a god send as my children seem to create holes in clothes almost instantly! Anyway, we were kindly sent The Great Grammar Book and The Terrific Times Tables Book. These are perfect ways to try to engage the kids in what are essentially quite dry topics. The books are colourful, interactive and interesting. Fifi (7) who is currently learning time tables has spent hours pouring over the Terrific Times Tables, asking me questions and revelling in little tips that she has learnt. Its the first time i’ve seen her really engage for a long time with a book. 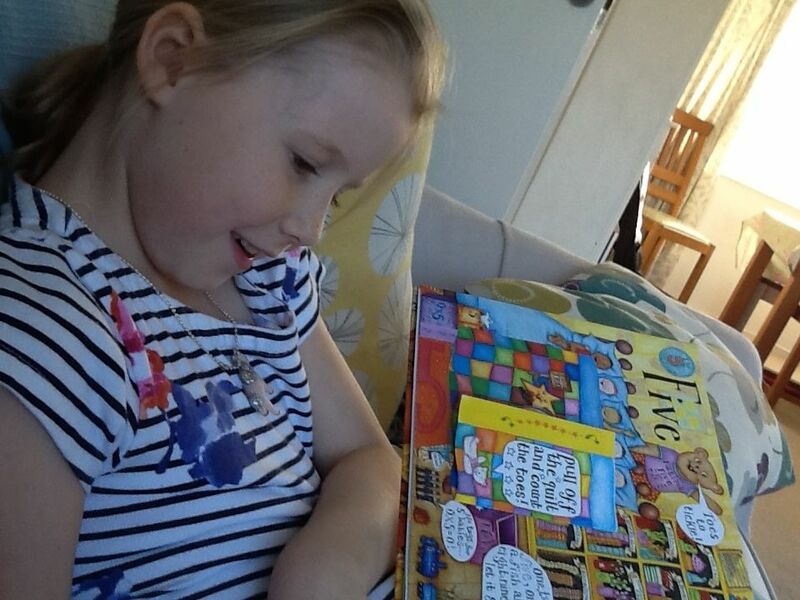 Its very difficult to find books which compliment school work and aren’t dull. These are anything but and all three children have been fighting over them. 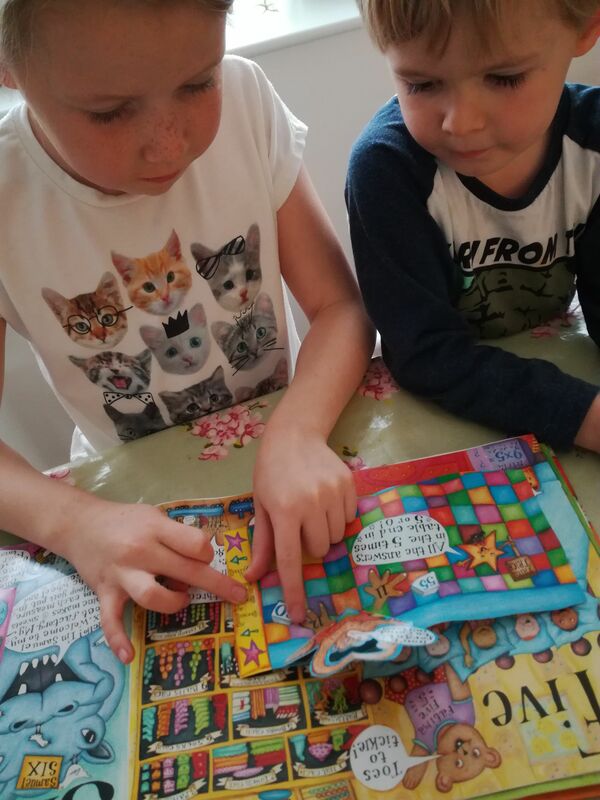 Clearly the youngest needs a little bit of supervision as they have lots of pop-ups which can be easily damaged, but to be honest if they are having a fight over a times tables book you know there is something good about them. As a child I was obsessed with looking at Jan Pienkowski’s amazing pop up books and it was brilliant to hear that Jennie was inspired by his books especially my favourite one- Haunted House. 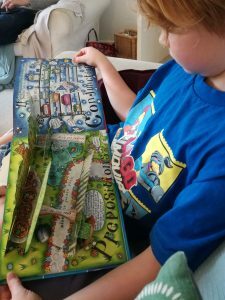 I can see her inspiration in these books and I do hope that for my children Jennie Maizels books make the same impression as Jan Pienkowski’s did for me. If you’re looking for the perfect Christmas gift for a primary school aged child then these are the answer, you really cant go wrong! When did you first develop your style of illustration? When I was in my second year of Art School, I went to Barcelona on an exchange for four months. When we turned up to the Spanish art school, we realised the course was in technical drawing, the students were all sitting in silence drawing carburettors! In those four months I was more prolific than I had ever been. Drawing every day and keeping an obsessive hand lettered journal for the whole duration of my stay. Without any influences or any instructions, I developed my own style and confidence. It was such a fun and memorable trip. What are your top tips for anyone interested in illustrating books for children? Firstly, don’t feel you have to write. 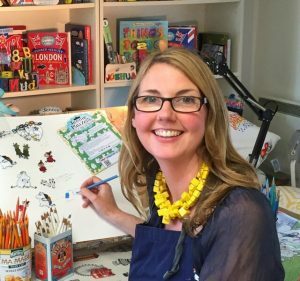 Publisher’s are looking for illustrators to pair up with Authors and it is very rare to be equally skilled in writing for children as illustrating (I certainly couldn’t write a Children’s story!). Start by illustrating an existing picture book but in your own style, this way you will see how your illustrations look when formatted in a 15 page book. It’s important not imitate, be true to your own style. I have always asked people’s opinions, children are the harshest critics but also sometimes the most accurate, my my own children’s advice is always the best. How long did it take you to illustrate The Great Grammar Book? The Great Grammar Book was my first ever Children’s book! I had barely left Art School. I remember finishing the first spread and then looking at what lay ahead of me and not thinking I could do it! My style is very laborious, so each book usually takes about six months to complete the artwork. The Grammar Book took even longer as I hand lettered the whole book TWICE (once for the UK and then for the US version). Now, my lettering has been made into a font, but I still hand render the titles and speech bubbles etc. What are you favourite topics to illustrate? I adore drawing buildings. I love the intricate challenge of recreating every window of a tower block, or every torrent of a castle. If I go on holiday I will always seek out the nearest town or village and sit and draw the architecture. Would you consider illustrating a fiction picture book? I would love to. However, I have been illustrating Pop Up Books for over 20 years and it is hard to branch out of what you are ‘known’ for by the publishers. Maybe one day a manuscript will arrive on my editors desk that she will think I am perfect for! How does it feel to see people wearing your Clothes Plasters when you’re out and about? It is so thrilling! To date I haven’t been able to stop myself from saying to them that I made them! I especially like seeing children wearing them, knowing that they have personalised their clothes and that in some way they feel more individual. Who are your favourite illustrators? I love Janet Ahlberg’s illustrations, as a child I was obsessed with The Old Joke Book, I think I can see it’s influences in my work even today. I also love Jan Pienkowski. The Haunted House was treated like the Crown Jewls in my home and it is still a huge treasure. I adore intense detail, The Butterfly Ball (illustrated by Alan Aldridge) was my favourite book as a child. I loved how it had hidden secret and so much colour! I’m not sure if it is still in print but I would really recommend it if you haven’t come across it. I am reading a wonderful book by John Lewis-Stempel called the Running Hare, it is an anecdotal diary of farming in today’s environment but using yesterday’s methods. It sounds dull but it is so beautifully written, peppered with fascinating facts and poetic language. I live very rurally and am deeply saddened by the decline in birdlife and the starkness of the modern day farming landscape. John Lewis-Stempel proves in his book that it is all totally unnecessary and nothing is gained my using chemicals or clearing land.